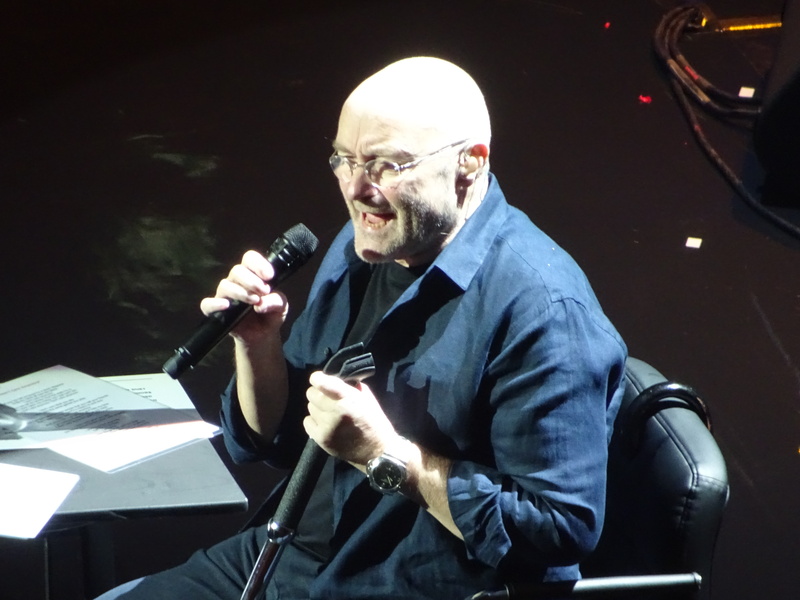 Phil Collins performs his third sold-out show at London’s Royal Albert Hall on June 7. Phil Collins calmly hobbled on stage amidst a chorus of welcoming cheers from 5,200 ecstatic fans at London’s Royal Albert Hall. The former Genesis frontman and Grammy-winning pop balladeer performed his third sold-out “Not Dead Yet Live” show at the iconic 146-year-old concert hall on June 7. Collins kicked off the 2.5-hour show with the No. 1 power ballad “Against All Odds” from 1984. Fans erupted with thunderous applause and a collective call of joy in response to the Collins classic. Collins performed his entire set seated due to a recent back operation. His 16-year-old son, Nicholas Collins, filled in for him behind the drum kit. It’s quite apparent Nick inherited his father’s tremendous drumming skills and knack for performing live. 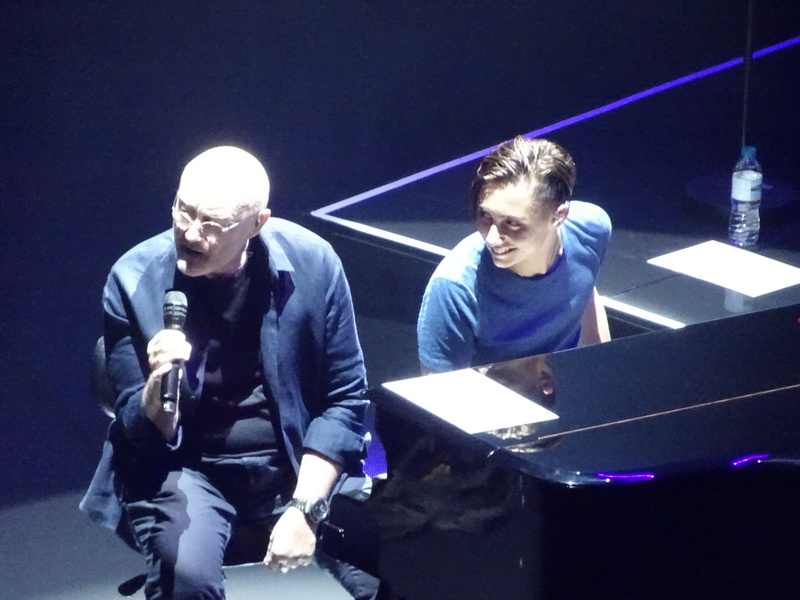 During the song, photos and videos of Collins and his bandmates – Peter Gabriel, Mike Rutherford, Tony Banks and Steve Hackett – flashed on the screen behind him. It served as an emotional and compelling recap of Collins’ nearly 40-year career with the band, and it was a pinnacle moment for Genesis fans. Fans eagerly waited to see if Rutherford would set foot on stage to play with his former bandmate, but he didn’t. It turns out he was there simply watching the show with his wife. It’s a shame the crowd couldn’t have a mini Genesis reunion, even if it was just for one song. Luckily, Collins also sang “Invisible Touch” during the second set of his show while fans enthusiastically welcomed another Genesis tune. Despite his recent health challenges, Collins still sounded sharp and committed to being back in the musical saddle. Toward the beginning of his second set, Collins and Nicholas Collins performed “You Know What I Mean,” a deep cut from 1981’s “Face Value.” Nicholas Collins played the piano while Collins sang next to his side. Other memorable performances included “Separate Lives” with backup singer Bridgette Bryant, who filled in famously for Marilyn Martin, and “Easy Lover,” Collins’ 1985 hit duet with Earth, Wind & Fire’s Philip Bailey. “Something Happened on the Way to Heaven” and “Sussudio” were crowd favorites as attendees sang in unison and danced along with Collins on two of his biggest solo hits. Another highlight included hearing Nicholas Collins perform one of the most famous drum fills in rock history during “In the Air Tonight.” Fans experienced a magical moment while playing air drums simultaneously with several thousand other budding drummers that night. Unfortunately, Collins had to postpone his June 8-9 shows at Royal Albert Hall after falling and hitting his head in a London hotel room. Those shows have been rescheduled for November 26-27. Those other 10,400 fans will have to wait a little longer to see Collins’ enigmatic comeback.